Have you ever wondered how you can reduce the amount of effort it takes to create a job advertisement? And how you can create job ads faster? In this article, we would like to show you how a successful and suitable job advertisement template can make your process easier. 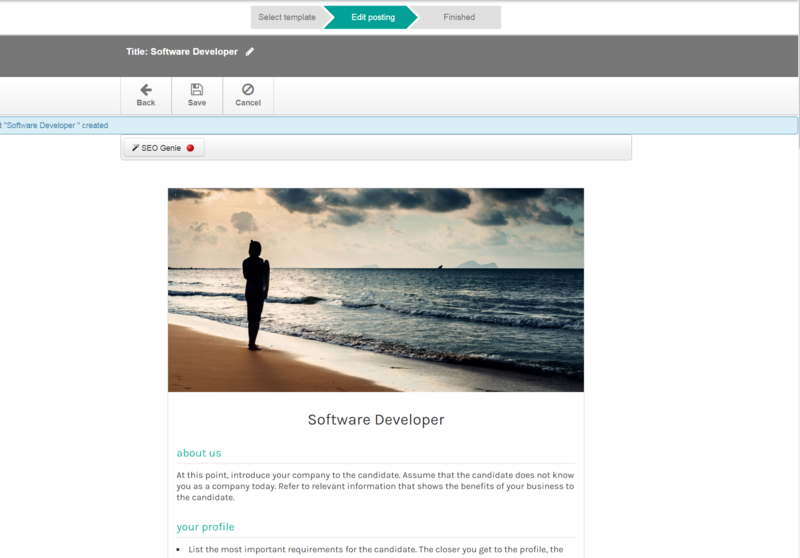 Alongside your career page, job advertisements represent the first important point of contact between you and your applicants. The decision to apply to your company depends on those two main factors. It is therefore important that your job advertisement is appealing to the desired target group. You should create a job advertisement template so that you don't start from scratch with every new open position. This will save you part of the effort and you will only have to adapt the template. We have put together the 9 most important components for you which must be taken into account when creating a successful job advertisement. With the help of this overview, you can anchor your employer brand attractively in the minds of the target group right from the start. Use an appealing design and key images to reach and appeal to the desired audience. A very powerful example of how important design and images can be is shown in this RunnersPoint article. First, research the most common name for your job offer. The title should be formulated precisely in order to generate a good search engine optimization. This is the only way to reach your desired target group. The description of the tasks should be short and easy to understand. Pay attention to the areas of responsibility and the employment relationship. In addition to the city, enter the postal code and the state. The professional and personal requirements of the applicant must be presented accurately and clearly. Present your company in a separate place of the advertisement and highlight the reasons why you are an attractive employer. The best way to do this is to take a look at your candidate persona. Here you will find help for creating a candidate persona. Describe the application process to the applicant and inform him or her of the desired file format. A personal contact person with contact data should not be forgotten. This button should be clearly visible. It should be connected to a Call-to-Action! Use tools for the visual representation of the workplace such as videos or the introduction of employees. References to your social media profiles and application tips will round off your job advertisement. Talention offers you the possibility to save templates in the system, which are adapted to your design and thus save a large part of effort and work. We would be happy to show you in a free demo how this process would look in your case. You can request a free demo here.